Take invisibility to places you've never seen before! Inventive invisibility options for alchemists and wizards! 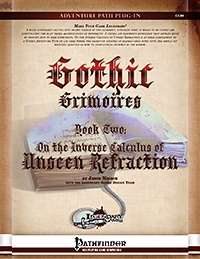 The second in our new line of Gothic Grimoires, On the Inverse Calculus of Unseen Refraction takes up the study of the dark side of invisibility. The power to walk unseen is hardly evil in itself, but what unraveling of the mind might occur as it struggles to reconcile the sense that you're not all there. Indeed, what might you do if you didn't have to look yourself in the mirror afterwards? This arcane text delves into invisibility as art and science, illusion and reality. On the Inverse Calculus of Unseen Refraction is an ideal complement to a Gothic Adventure Path or any game where alchemy, magic, and mad science intersect. Featuring a detailed history and description, this tome uncovers new frontiers for alchemical and optical experimentation and creation, including 6 new alchemical discoveries, a new metamagic feat, and 8 new spells and alchemical formulae, ranging from the Transparency Mutagen to vitrific visibility. Designed by Jason Nelson with the Legendary Games design team of Neil Spicer, Greg A. Vaughan, Clinton J. Boomer, Matt Goodall, Jim Groves, Russ Taylor, and Clark Peterson. Legendary Games combines stellar writing talent with innovative layout and product design and top-notch artistic values that we think will bring you back again and again.